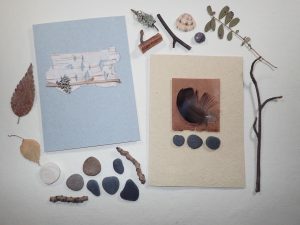 Twigs, bark, feathers, leaves, and stones are a few of the natural materials Connie Stricks and Susan Campbell use in their artist books. Join them at our September program meeting as they share their passion for natural materials along with examples of their work. For our program activity, we will create cards using natural materials that Connie and Susan will provide (twigs, birchbark, and stones). A variety of neutral shades of Khadi paper will be available along with Arches Text Wove inserts that will be stitched to the Khadi with a pamphlet stitch. Please join us as we explore the myriad possibilities that natural materials provide while composing elegant cards.